Are you going on a cruise, but worried about seasickness? 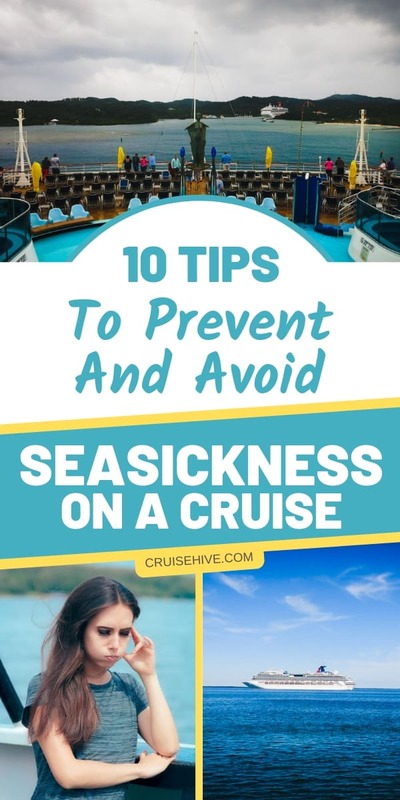 Read on to learn the top tips on how to prevent seasickness on a cruise. Seasickness is a common concern for first-time cruisers and seasoned cruisers alike. No one wants their cruise interrupted because they are feeling terrible. Seasickness is a battle of the senses. Your brain relies on signals from your eyes and inner ear to tell the body how to move. When this signal or message is off, you can feel nauseous or queasy. Seasickness varies in intensity from person to person, and although not life-threatening, it can be a miserable experience. If you are planning a cruise and are think you might experience seasickness, we can help! Here are 10 tips on how to prevent seasickness. You can help reduce the possibility of getting seasick by planning ahead. The size of the ship makes a difference, and a larger ship is better. Just like you feel less turbulence on a large airplane, the same theory applies to cruise ships. You are less likely to feel motion on a larger ship. Newer ships also have stabilizers that help to decrease the ship’s roll. This provides a smoother ride and decreases the chance of seasickness. If you are a first-time cruiser and have concerns about seasickness, you may want to take a short cruise rather than pending multiple days at sea. A short trip can help you test your sea legs, and you can avoid being sick for several days. A cruise that hugs the coastline is more protected from the waves than one over the open water. If you are prone to seasickness, on ocean voyage crossing the Atlantic or Pacific may not be the wisest choice. The waters of The Gulf of Mexico or the Caribbean are calmer. You can also opt for a cruise that is port intensive and spends less time at sea. Selecting the right cabin can help you avoid seasickness. You feel the most motion on the upper decks and the front of the ship, so try to book early to avoid these areas. You will feel the least movement in the center of the ship. To avoid getting seasick, you may want to choose a cabin in a lower deck and in the middle of the ship. The placement of the bed matters too. Some people find that moving backward while lying down makes them queasy. You should also consider whether you want a cabin with a window or a porthole. If you are a little claustrophobic, a windowless cabin isn’t a good choice. If you feel queasy in your cabin because it’s bobbing back and forth, take a walk to an open cruise deck. Take in the view and watch the horizon. Looking in the distance can help you regain your equilibrium and fight dizziness and nausea. The fresh air can help combat seasickness too. Many people swear by the effectiveness of ginger for curing seasickness. You may not be able to find it on the ship, so pack some ginger syrup to take with you. If ginger syrup doesn’t appeal to you, try ginger capsules, ginger ale, or ginger candy. Whatever you choose, it should contain real ginger, not just ginger flavor. It’s important to stay hydrated all the time, especially when you are out of your regular routine. Dehydration can lead to seasickness or make the symptoms worse. If you will be drinking alcohol on the cruise, be sure to drink plenty of water as well. If you are feeling queasy, it’s best to avoid alcohol completely. When you step on a cruise ship, the sights can overwhelm your senses. There’s so much to do and see, and it’s tempting to try to do it all. Food and alcohol are abundant on a cruise, and many cruisers will overindulge. But eating or drinking too much can make you sick and make seasickness much worse. If you are prone to seasickness, keep your meals light and limit your alcohol intake. Take some time to relax and don’t worry about seeing or doing everything on the ship. Some people love to sleep on a cruise and let the waves rock them to sleep. But for others, the movement of the ship causes seasickness. To avoid this, you can try tightly tucking yourself into bed. To do this, tuck one side of the sheet under the mattress and then roll yourself into the sheet from the other side. Feeling secure can help minimize the movement you will feel and keep your body feeling balanced. You can purchase over the counter medications to prevent the onset of seasickness. Two popular ones are Dramamine and Bonine. These medications work best if you begin taking them a day or two before your cruise so your body can adjust to them. If you have other health conditions or take prescription medication, you should ask your doctor if these drugs are right for you. Wearing a Sea-Band is another option, you can get from Amazon right here. These are cotton bracelets you wear around your wrist. A small stud pushes against your wrist and is supposed to prevent nausea. They do not work for everyone, but many people use them as a natural remedy for seasickness. You can also try the seasickness patch for your cruise vacation. If you have experienced seasickness before, you may want to talk to your doctor before your cruise to see if prescription medication might help. Scopolamine patches are a popular treatment. It’s a small patch you place behind your ear to help prevent or reduce nausea and vomiting associated with motion sickness. It helps to begin using the patches before your cruise so your body has time to adjust. If you plan to go on a cruise and you have experienced motion sickness in the past, be sure to discuss your concerns with your doctor. There’s a lot you can do to avoid or minimize the effects of seasickness. Preparing for your cruise and the possibility of motion sickness can help you worry less and enjoy your vacation more. Going on a cruise is a fun and amazing experience you don’t want to miss because of seasickness. So plan ahead and enjoy your dream cruise now that you know how to prevent seasickness. Whether you are planning your first cruise or are a seasoned cruiser, you will love our informative blogs about cruising. Be sure to check out our website.